Take her first ever Live Online Piano Class! Beginners and intermediate students who want to learn to play from lead sheets. Anyone who wants a review of lead sheet playing with a Christmas theme. More details found below the video. 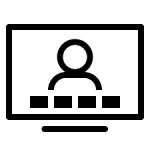 Online Classes Offer Multiple Ways to Learn! Participate in live, multi-camera lecture/demonstrations. All you have to do is click a link! You’ll be able to join the lesson with your phone/webcam if you wish so you can ask questions in real time! REPLAYS – for a full year. All of the videos will be available for replay for one year, so you can go back and re-watch them as many times as you need to. Great for brushing up on your carols next year, or taking them to the next level! Access Lisa five days a week in a special closed facebook group where you can ask questions and share practice videos for individual feedback and support from fellow students. Share your own practice videos. Direct access to Lisa via this group during the 4 weeks of the course, Monday- Friday. 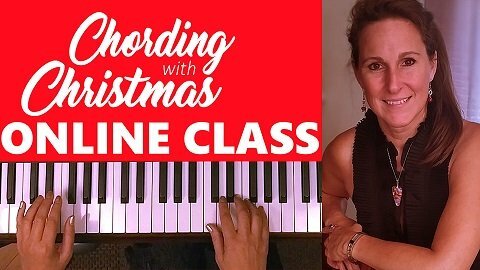 The course includes the Chording With Christmas ebook, plus any additional handouts, musical examples, and reference videos. It’s not too late to join! You can join now and watch the first replay and then attend the next lesson with us live. Beginners and intermediate students who want to learn to play from lead sheets, and anyone who wants a review of lead sheet playing with a Christmas theme. The ebook Chording with Christmas ($16 value) available for download immediately after registration. Group chat where you can share videos and stories. Ask the teacher questions during the 4 weeks of the class. Mon-Fri.
Fun learning Christmas Carols chord style! Beginner and Intermediate Levels covered. Able to play right hand alone, and some experience reading music. The sheet music provided will have a version with letters written inside the notes for those who need the help.